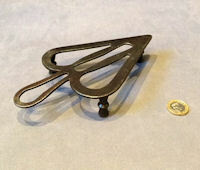 Original, quality late 19th century wrought iron trivEt for a smoothing iron. 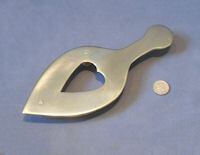 This example has a pierced heart shaped top plate with a loop handle and three turned feet. The first we have seen of this design. Cleaned and lacquered and complete and in good and working order. 8.25" x 4.5" and 1.25" tall. Original, quality 1920's miniature 'Mrs Potts' type cast iron with a drop off elliptical shaped body and a 'D' shaped oak handle. This is the first we have seen of the miniature version, sadly no makers name, but a little beauty nevertheless. Cleaned and waxed and complete and in good and working order. Body 3 5/8" long + 1.75" and 2.75" tall including handle. Original, quality late 19th century cast iron goffering or tally iron with a wrought iron 'S' shaped stem and a circular cast iron base. This clean example has '11' impressed to the underside the base and of the iron. The heating poker is missing, otherwise all is complete and in good order with remains of the original black paint to the base. Cleaned and lacquered. 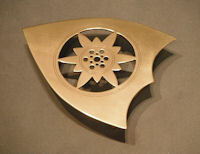 6.75" tall, base 4" diam + iron body 5" long. Original, quality late 19th century rectangular shaped Billiard Table Iron with the original steel cover. This example has a cast iron body with a cast iron handle mounted on two wrought iron stems. The body is embossed "Burroughs & Watts London" for the supplier and manufacturer of billiard table. A very clean example not too large and great with the sleeve intact. All has been cleaned and lacquered and is complete and in good and working order. Base 8.5" x 4.5" and 5.5" tall. Original, quality late 19th century wrought iron egg shaped iron with rounded ends on a wrought iron stem and a turned ash shaft. 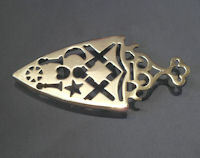 This type of iron was used to finish odd shaped garments such as puff shoulders and sleeves and also a variety of hats. All has been cleaned and lacquered and is complete and in good and working order. 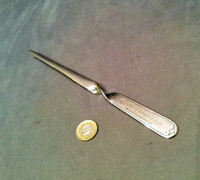 13.5" long in total and head only 2" x 1.5". 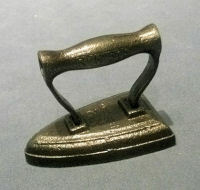 Original, quality late 19th century oval shaped cast iron laundry iron with a blacksmith made wrought iron handle. 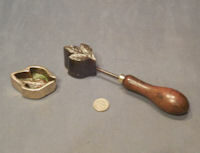 This example embossed 'Carron' for the maker and '00' for the size. Has been cleaned and lacquered and complete and in good order. 2.75" tall and 3.75" x 2.25" body. 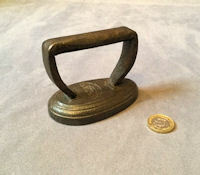 Original, quality late 19th cenutry oval shaped cast iron laundry iron with a wrought iron handle. This example appears unused and in the original black paintwork and is impressed to the top 'Carron' for the iron foundry and '1' for the size. Complete and in good and working order. Sole 4.25" x 2.25" and total height 4". 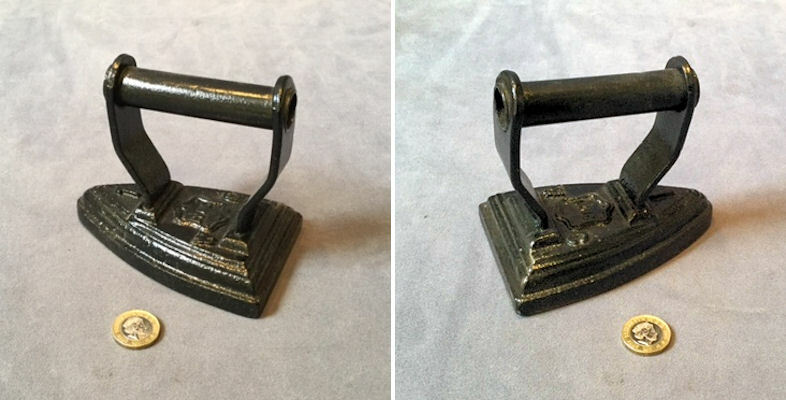 Original, quality late 19th century cast iron laundry iron with a wrought iron handle and embossed to the upper surface "Sylvester's Patent" and '2' for the size. Cleaned and lacquered and complete and in good and working order. 4.25" tall, body 5" x 3.5". 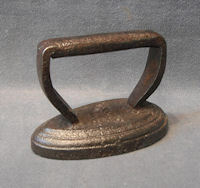 Original, quality late 19th century cast iron laundry iron with a wrought iron handle and embossed to the upper surface "Lyng W.C" and '1' for the size. Cleaned and repainted black and complete and in good and working order. 4" tall, body 5" x 3.25". 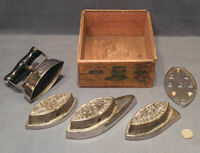 Original, quality, set of four asbestos irons, with one cover with handle, three different shaped clip on cast iron bodies, one steel trivet and most of the original wooden crate, with a good detailed label showing this set of irons. The top of the steel cover is stamped "Patent May 22nd 1900" and each of the bodies are embossed "Asbestos Sad Iron". The crate is complete apart from the slide on lid. All appear complete, apart from originally having a sheet of asbestos been fitted inside the top of the clip on cover, this has been removed in the past. All has been cleaned and lacquered, with the black paint to the handle and locking mechanism original. A good find with the crate too and label. Crate 7.5" x 6.5" + 3" tall, longest iron body 6.75" x 2.5" and 1.75" tall. Price is for the set. 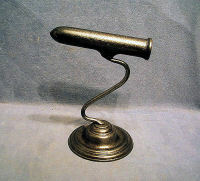 Original, quality, late 19th century, small cast iron smoothing iron with a wrought iron handle. The body is detailed with "000" for the size and "Sylvester Patent". All has been cleaned and lacquered and is complete and in good order. A most unusual size. Sole 2.75" x 4.25" and total height 3". 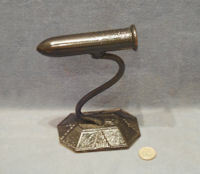 Original, quality, late 19th century, cast iron goffering or tally iron on a 'S' shaped wrought iron stem, all mounted on an eight sided cast iron plinth. The plinth is partly decorated to the upper and has "1" to the underside and all has been cleaned and lacquered. The heating poker is missing but otherwise all is in good order. These were used to iron collars and cuffs and earlier to iron out ruffs worn around the neck. 6.5" tall, 4.75" barrel length, inner diameter 0.75", base 4.25", 3". 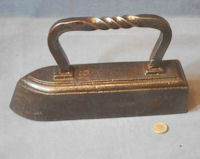 Original, quality, late 19th century, small cast iron laundry flat iron with a wrought iron handle and embossed to the top of the body "000" for the size and "Salter" for the manufacturer. This example is not only small, but it is more pointed than the normal. Cleaned and lacquered and complete and in good and working order. Body 4.25" x 2.75" and 3.25" tall. 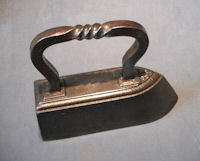 Original, quality, late 19th century, cast iron smoothing iron with a convex sole. Used to iron cold water starched items such as gents dickie fronts, collars and cuffs. This example is embossed "Silvesters Patent, Salters" and "2" for the size. All has been cleaned and lacquered and is complete and in good order. 4.25" tall, 3.25" wide and 4.75" front to back. Original, quality, cast iron, gas iron, with a replacement turned wooden handle copied from the original and the original brass mount for the gas inlet. The top plate of the cast iron body is embossed with the Maltese Cross logo, "Hot Cross", "British Made", "Patent","1" for the size and with the registration number for the year 1904. All has been cleaned, lacquered and is complete and in good order. Sole 5.5" x 3.5", total length 10" x 6.25" tall. 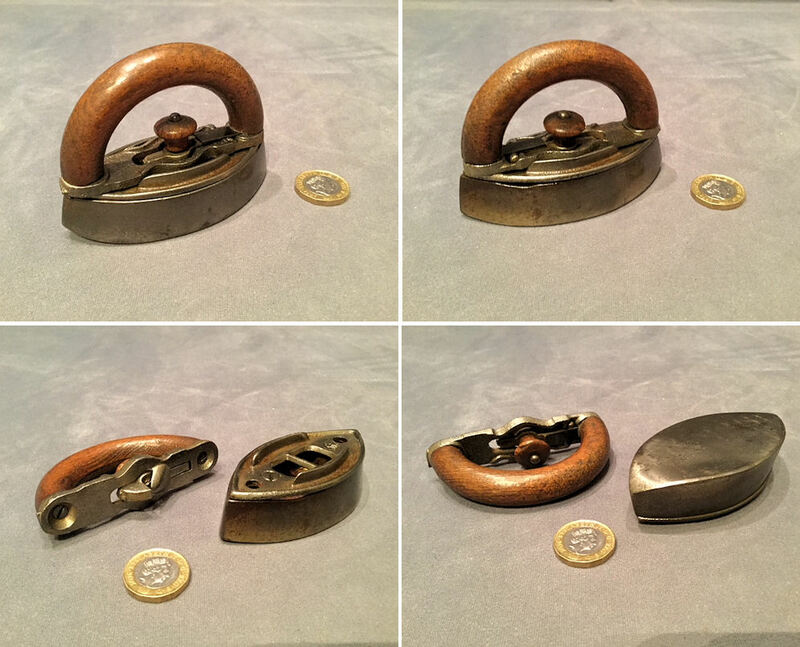 Original, quality, late 19th century, laundry iron, with a drop off body and a 'Mrs Potts' style wooden clip on / off 'D' shaped handle. The main body has the original grey silver painted top surface, is embossed with "2", the handles have the original grey / silver paint to the plate and the original lacquer to the wooden handle and knob. The top plate is also embossed with "FG" within a shield logo. 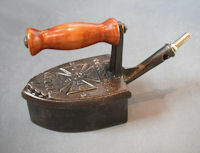 This iron appears unused although there is a scorch mark to the wooden handle. Originally these were supplied with two bodies and one handle and one body would be heated on the stove when the other was in use. Base 6.25" x 3.25" and total 5" tall. 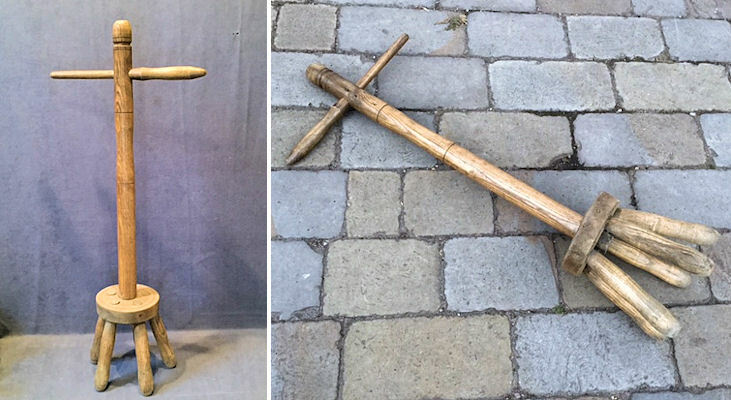 Original, quality 1920's, wrought iron, egg shaped iron, with a pointed ends mounted on a steel shaft and a tapered turned pear or apple wooden handle. This type of iron was used for finishing unusual shaped garments such as puff shoulders and sleeves and also a variety of hats. 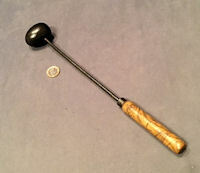 The wooden handle is tapered to fit in a stand if required, or was used in the hand . All has been cleaned, waxed and is complete and in good and working order. An unusual find today. 14.5" x 2.75" x 1.5". 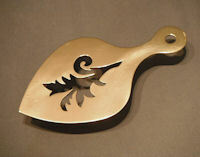 Original, quality, late 19th century, wrought iron tailor's iron, referred to as a 'goose'. This very clean example has the standard pointed body, with a top handgrip in wrought iron with a rope twist to the centre. The front at the top is embossed "14" for the size. Cleaned, lacquered and complete and in good and working order. Sole 8.5" x 3" and total 7.75" tall. 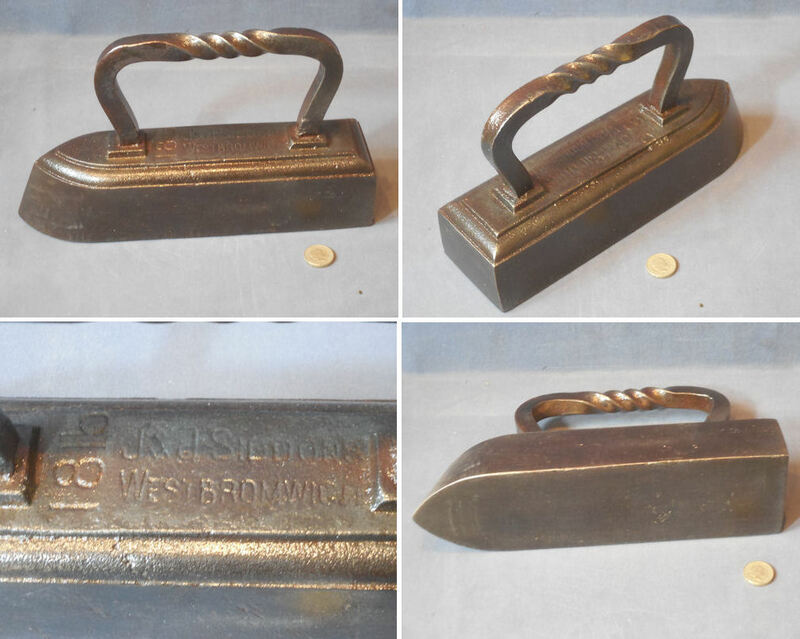 Original, quality 1920's, shaped iron, with a turned wooden handle and a brass ferrule. This iron was used to iron the brim on bowler hats and has the original red stained colour to the handgrip. Cleaned and lacquered, although the lacquer may be removed at no extra cost. These are few and far between today. It is complete and in good order. 14.5" x 1.5". 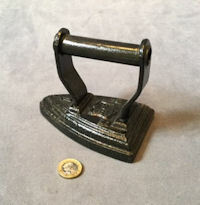 Original, quality, superb small travelling 12 volt electric iron, with the original plastic covered flex and the bakelite connector to use on a light bulb holder. 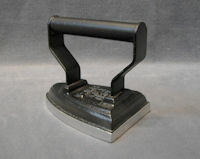 The body of this iron has a red top section, a black bakelite handle, and is printed to the label "Clem 200 / 250 Volts", "Patent Applied For The Year 1945" and "Clayton, Lewis and Miller Ltd, British Made". All is complete and in good order, but not suitable for use. Sole 4.25" x 2.25", body 3" tall including handle. Original, quality, 19th century, cast iron goffering iron with a wrought iron neck and circular cast iron base. These were used to iron collars and cuffs and earlier used to iron ruffs worn around the neck. The iron is impressed '13' for the size and 'W Bullock + Co' to the underside of the base. Sadly lacking the heating poker but otherwise complete and in good order, cleaned and lacquered. Base 4.5" and 8" tall. Barrel 6" x 1.25"
Original quality, 19th century, cast iron goffering iron with a wrought iron neck and circular cast iron base. 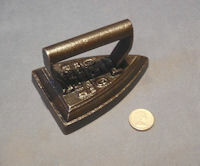 The iron is impressed '13' for the size and embossed 'Kenrick' for the manufacturer A.Kenrick of West Bromwich. Sadly lacking the heating poker but otherwise complete and in good order, cleaned and lacquered. Base 4.5", height 7.5" and bullet shaped body 6" x 1.25". 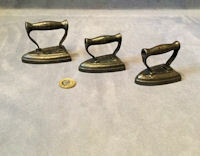 Many original quality, late 19th century and early 20th century, cast iron laundry flat irons of various makes and sizes, all cleaned and repainted and generally in good order. 5" to 6" long, 3" to 4" wide, 4" to 5" tall. Price is for each. 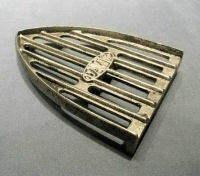 Original quality, 1920/30's, light weight smoothing iron cast in aluminium. The body and handgrip have been repainted and the sole and edge polished, cast into the top of the body 'Dainty Flat Iron'. Complete and in good order. Body 4.75" x 3.25" x 4.25" tall. Original quality travelling electric iron in its original cardboard carton, with a brass plate for the maker 'Lucas Holden of Coventry' also detailing the registration number for the year 1947. Appears unused and complete and in good order. Carton 6.25" x 3.25" x 2.5" tall. Original quality, 1920's, chrome plated travelling iron in the scruffy but original box with an opened tin of meta tablets. This iron would have been heated by 'Meta' (methylated spirit) tablets, when placed on a pan beneath the body, with the iron turned upside down. The body is stamped 'British Boudoir Iron' and 'Patent Applied For'. Some paint missing from the green finished wooden grip, but otherwise complete and in good order. Box 7" x 3.25" x 2.5". 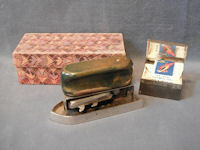 Original quality, 1920's, chrome plated travelling iron in the original box. 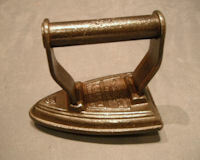 This iron would have been heated by using a 'meta' (methylated spirit) tablet, placed on a pan under the body with the iron turned upside down. Some burn marks to the lilac painted wooden grip and the box is rubbed at the corners, otherwise all is complete and in good order. 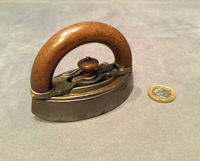 Original quality, 19th century, oval shaped small smoothing iron marked to the top of the body with (difficult to read) 'Carron' for the maker and 'O' for the size. Pitted all over but otherwise complete and in good order. Has been cleaned to the metal finish and lacquered. Sole 4" x 2.25" x 3" tall. Original, quality late 19th century cast brass iron stand with a pierced design of the three legged emblem for the 'Isle of Man' and with a heart cut out to the front and three cast brass legs. A good weight and a good unusual design. Polished and lacquered, although the lacquer may be removed at no extra cost. Complete and in good order. 9.25" x 4" and 1.5" tall. 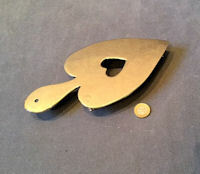 Original, quality late 19th century cast brass laundry iron stand (trivet) with three legs and an outer frame shape of a "Love Heart" with a smaller love heart within it. Most unusual. Polished and lacquered, although the lacquer may be removed at no extra cost and complete and in good and working order. 5.75" x 4.25" and 1.25" tall. 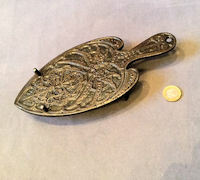 Original, quality late 19th century very decorative cast iron smoothing iron stand with a good "Asthetic Movement" design, embossed to the upper surface. This example is reputed to be designed by Dr. Christopher Dresser. The underside is detailed in relief for the manufacturer "A. Kenrick & Sons" of West Bromwich, "No 8" and with the registration number for the year 1884. All has been cleaned and lacquered and is complete and in good and working order. 9" x 4.25" and 1.25" tall. 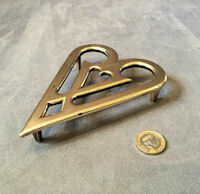 Original, quality late 19th century heavy sheet brass laundry iron stand / trivet with a pierced design of a heart, a hand grip to one end and three turned feet. Polished and lacquered, although the lacquer may be removed at no extra cost and complete and in good and working order. 9.25" x 4.5" x 1.25" tall. Original, quality late 19th century thick sheet brass laundry iron stand/trivet with a pierced detail of an unusual design with a pierced handgrip to the end and three turned brass legs. Polished and lacquered, although the lacquer may be removed at no extra cost and complete and in good and working order. 8.5" x 4.25" and 1.5" tall. Original, quality pair of late 19th century cast pink brass laundry iron stands/trivets. 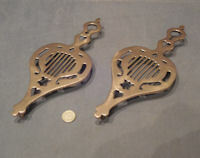 These unusual examples eaach have a pierced decoration 'lyre like' with a heart cut out above and below, three tapered legs and a handle form to one end. All has been polished and lacquered, although the lacquer may be removed at no extra cost and all is complete and in good and working order. 11" x 4.75" x 1" tall. 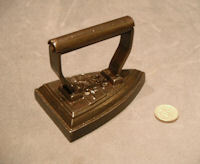 Original, quality late 19th century superb pierced sheet brass, laundry iron stand / trivet. This example is much more decorative than normally found, has cut out stars and a ' lyre ' to the top and a reverse castellated side trim all round. Polished and lacquered, although the lacquer may be removed at no extra cost and complete and in good and working order. 10" x 4" x 1.5" tall. Click on photo for larger anf other view. Original, quality, late 19th century, thick sheet brass, iron stand with a cut out heart design and standing on three turned feet. All has been polished and lacquered, although the lacquer may be removed at no extra cost. Complete and in good and working order. 9.5" x 4" and 1" tall. 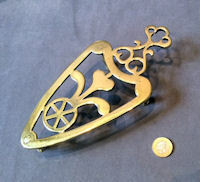 Original, quality, late 19th century, pierced sheet brass flat iron stand / trivet with a pierced design to the centre, a handle to one end with a hole for hanging up when not in use and three turned brass legs. The underside is in the old finish and the top has been polished and lacquered, although the lacquer may be removed at no extra cost. 8.5" x 4.5" and 1.25" tall. 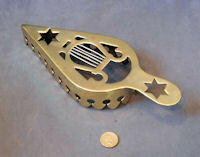 Original, quality, late 19th century, pierced sheet brass flat iron stand / trivet with a pierced design to the centre, an iron shape to the body and three turned brass legs. The underside is in the old finish and the top has been polished and lacquered, although the lacquer may be removed at no extra cost. 6.25" x 5" and 1.25" tall. 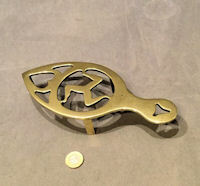 Original, quality 1920's, cast brass laundry iron trivet, with three legs and a pierced design to the top. Polished and lacquered, although the lacquer may be removed at no extra cost. Complete and in good order. 10" x 4.75" and 1.75" tall. 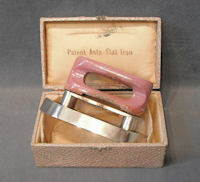 Original, quality, 19th century, cast pink brass trivet in the shape of a flat iron. 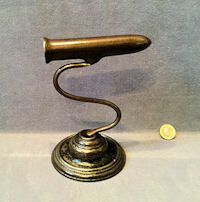 This heavy example has a pierced pattern overall, a handgrip to the rear and three tapered brass feet, all cast in one. 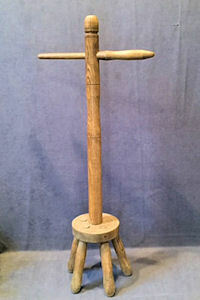 Used originally to stand a hot iron on, but useful generally as a potstand. Polished and lacquered, although the lacquer may be removed at no extra cost. Complete and in good order. 9.75" x 5"and 1.25". Original, quality, 1920's/30's, cast iron, gas iron stand with most of the original chrome plating, ribbed supports, three legs and an embossed logo, detailing 'Davis'. Complete and in good order. 6.75" x 4.5" x 1.25". Price is for each. Original, quality circa 1900, blue and white enamelled advertising plaque originally fitted to the front of a chair back. These chairs were produced as an advert and in the Retail Grocers and Ironmongers premises for customer's convenience. 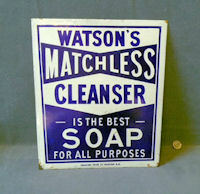 This very clean example details "Watsons Matchless Cleanser is the best Soap for all Purposes" and has the maker's details to the lower edge for Falkirk Iron Co Falkirk NB" (North Britain). 14" tall, 13" wide at top and 11.25" wide at bottom. 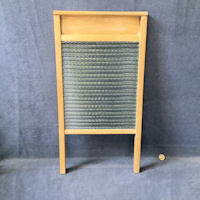 Original, quality, pre-war, pine framed washboard, with a ribbed sheet glass panel. These were used to scrub the soiled clothes against when washing the laundry. These were also popular played with thimbles by skiffle groups and they really do work. This is a very clean example, no chips or damage and complete and in good order. 23" x 12" and 1.25" front to back. 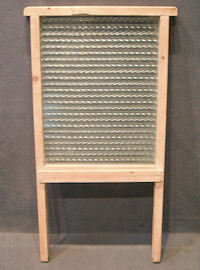 Original, quality, pre-war, pine framed washboard, with a ribbed sheet glass panel. These were used to scrub the soiled clothes against when washing the laundry. These were also popular played with thimbles by skittle groups and they really do work. This is a very clean example, no chips or damage and complete and in good order. 24.75" x 13.25" and 1.25" front to back. 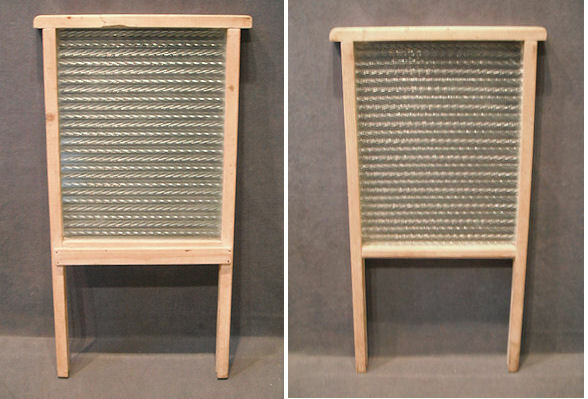 Original, quality late 19th century washing Peggy turned in ash, originally used with wood or ribbed galvanised washing tubs. This example has pegged joints to the five legs and a slide out top 'T' bar. Some worm holes but well treated. Complete and in good order. 35.5" tall, 10" diam of feet and T bar 15.5". 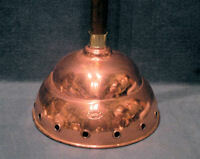 Original, quality 1920's copper washing posser, with a long wooden, shaft. This example is embossed 'Simplex "No 9" and has been polished and lacquered, although the lacquer may be removed at no extra cost. These were used, with a wash tub or bath and pushed up and down in the water, the water was forced through the holes underneath and out of the hole on top. Some minor dents otherwise complete and in good and working order. Total 51" tall, base 8" diam and posser only 5" tall.